Today Zoroastrianism is popularly considered the source for the ideas of monotheism, of the devil, and the theological distinction between the devil's evil and a good god; the theological teaching of a resurrection, among others. Mary Magdalene and the red eggs aren't the earliest examples of eggs as a spring symbol. In Persia, eggs have been painted for thousands of years as part of the spring celebration of No Ruz, which is the Zoroastrian new year. In Iran, the colored eggs are placed on the dinner table at No Ruz, and a mother eats one cooked egg for each child she has. The festival of No Ruz predates the reign of Cyrus the Great, whose rule (580-529 b.c.e.) marks the beginning of Persian history. "[T]he ancient Persians, 'when they kept the festival of the solar new year (in March), mutually presented each other with colored eggs'"(Doane 1882, 228 emphasis original). "We are told that the Persians, when they keep the festival..."
Doan hides the fact that this is an observation contemporary with him in the mid-19th century. He hides this by eliminating the words from the original that show this is an anecdotal comment, as well as by changing the tense of the verb "to keep" from present to past. Both of these are examples of anecdotal fallacy or misleading vividness. While the Chambers's Encyclopedia might be including this merely as a point of curiosity leading to an unintentional fallacy, Doan's use can only be understood as deliberate. This argument evidently comes into the anti-Easter literature at some date after Hislop's 1858 Two Babylons. Hislop, who was eager to grab on to any pagan example he could claim as source, does not make use of this particular argument against Easter—not even in his convoluted treatment of the Easter egg (Hislop 1999, 109–110). The association is not found in earlier Radical Protestant writers Cotton Mather nor in George Frank von Frankau's 1862 De Ovis Paschalibus. Von Oster-Eyern . The association is also absent from Jacob Grimm's (d. 1863) Teutonic Mythology. Given the importance of Doane's work to subsequent anti-Christian apologists this appears to be the most likely source of this criticism. At least until older clear evidence can be found. There are no ancient texts that mention Nowruz or even refer to a new year celebration among the Persians, particularly among what are considered the founding scriptures of Zoroastrianism: called the Avesta. The earliest reference to the word Nowruz is from the Sasanean empire, which didn't begin until 224 A.D [third century after Christ]. And of the Sasanean documents, they appear to come from the end of the empire in the mid 7th century--when the empire was overrun by Islam. The oldest surviving copy of the Avestas actually comes to us from A.D. 1323. Many articles on the net claim that Nowruz is actually mentioned in the Arsacid/Parthian era (247 BC-224 AD). But there is no actual evidence. There are a few inscriptions that record other events but are dated according to both the Macedonian calendar and to the Persian Zoroastrian calendar. These inscriptions do not mention Nowruz, they merely confirm that the Persian Zoroastrian calendar was in use and was based strictly on the old Egyptian solar calendar of 365 days. In other words, the identifying characteristics that these are Zoroastrian dates rest in the fact that the dates were not synchronized to the solar dates, but that the dates were off by the appropriate length of weeks compared to the Sothic cycle. That is, there was no Spring Equinoctial New Year festival through this period. There may have been a "new year" festival--but it is still undocumented, and it would have occurred in a very different part of the solar/seasonal year. A difficulty for accepting this straightforwardly as a Parthian account of Nowruz festivities is that during the Arsacid period the month Fravardīn continued to recede slowly against the natural year, passing through winter into autumn, while in the poem this joyous celebration is called the Bahārjašn, the “Spring Festival”. This expression is recorded by Biruni (Qānūn, Vol. I, 1954, pp. 260, 264, see de Blois, 1996, p. 47) for the Greater Nowruz of 6Ādar, which belongs to the Sasanian calendar reform of the sixth century C.E. There are two passages in Vis u Ramin where the text has obviously been adjusted to that calendar change, but this can hardly be a third one, for this spring festival, being an essential part of the story, should belong to the epic’s Parthian core. What this means can be shown fairly easily. Let us grant the possibility that eggs were used in the celebration of Nowruz in the first through sixth centuries A.D. [We need to emphasize that eggs do not show up in the historical record of Nowruz until after the 17th century-- well after the formation of the tradition of eggs at the end of the Lenten Fast for Christian Easter]. During the development of the use of eggs at easter the Zoroastrian calendar was so far out of synchronization with the Julian calendar that a seasonal or festival borrowing or cross-pollination makes absolutely no historical sense. What does make historical sense is the possibility that a highly adaptive religion (Zoroastrianism) incorporated the tradition from Christians in the territories where Zoroastrianism survived into the 10th and 11th centuries A.D. when the Zoroastrian calendar came to finally be fixed with the solar year. It was not until that point in history that Zoroastrians were celebrating Nowruz at the Spring Equinox. It seems reasonable to conjecture that the Lenten fast and the breaking of that fast with the eggs that had accumulated during it could be the source of the Zoroastrian tradition. I put this forward as a suggestion, not as an historically demonstrated development. It is also quite possible (though in my view somewhat unlikely) that the traditions developed independently of one another. The Bible places the origins of Passover festival and its dating at about 1,440 BC with the final plague upon Egypt and the Exodus of the Israelites under Moses (Ex. 12-14). The Christian festival of Easter is directly dependent upon the festival of Passover even though the date of the festival came to be determined differently from the methods used in Judaism. The date described in Exodus is the first full moon in the month of Abib. The name of the month means roughly "full heads of green barley". By extension the word means "Spring." The use of this month name implies a lunar calendar based on agricultural season rather than a luni-solar calendar. The Babylonian luni-solar calendar strongly influenced Old Testament Israel. Israel adopted the Babylonian month names and some of the intercalation practices of the Babylonian calendar for the ritual/liturgical calendar. The month of Abib was given the Babylonian name "Nisan." Indeed, if Nowruz were actually celebrated in the early first century the 365-day cycle of the Persian Zoroastrian calendar would put the new year date not at the vernal equinox but approximately four months earlier than the vernal equinox--probably early December at the beginning of the century to mid-November at the end of the first century. 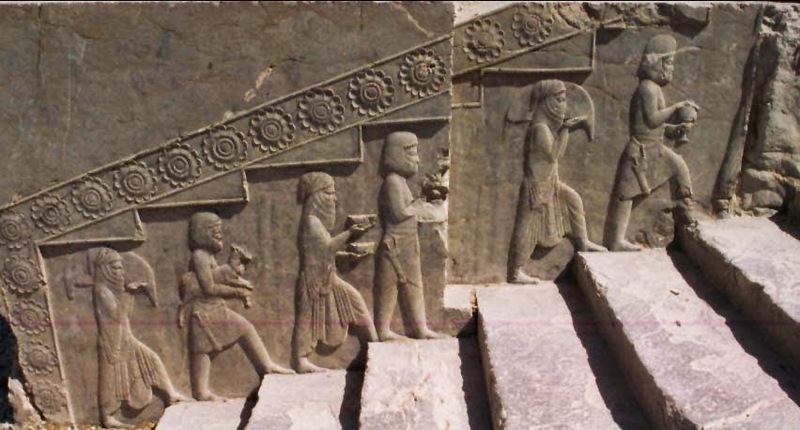 Nowruz would not match up with the vernal equinox until the 11th century AD. The egg had become a part of the ritual Passover meal as one of those "two dishes" possibly by the late 4th century A.D. The discussion surrounding the meal in the Babylonian Talmud (finished in the 6th century A.D.) includes very little about the reasons for and use of eggs in the ritual Passover meal other than that eggs may qualify as one of the two dishes. The ritual use of the egg at the Passover meal and its use by Christians do not have a common doctrinal/legal or identifiable common historical cause. Rather, the development of the ritual use of the egg in the Passover meal had an independent complex history, finally becoming widely used in the 12th century A.D. Starting in the late 12th century, it became more or less standard practice to put a zeroa and an egg on the seder plate. This custom was recorded by Rabbi Yitzhak ben Abba Mari (Marseilles, 1120-1190; Sefer Ha'ittur, Vol. 2, fol. 133c); Rabbi Abraham of Lunel (written in Toledo, 1204; Sefer Hamanhig, parags. 64-65, ed. Refael, pp. 481-482); Rabbi Vidal de Tolosa (Spain, 14th century; Maggid Mishneh to Rambam, Hametz Umatzah 8:1); Rabbi Alexander Zusslein Hacohen (Germany, d. 1349; Sefer Ha'agudah, ed. Brizel, Vol. 2, p. 191); Rabbi Ya'akov ben Asher (Toledo, d. 1343; Tur Orah Hayyim 473); Rabbi David Abudraham (Seville, 1340; Abudraham Hashalem, p. 217) and Rabbi Yosef Karo (Safed, ca. 1550; Shulhan Arukh Orah Hayyim 473:4). Doane, T. W. Bible Myths and Their Parallels in Other Religions Being a Comparison of the Old and New Testament Myths and Miracles with Those of Heathen Nations of Antiquity, Considering Also Their Origin and Meaning. 4th ed. --. New York: Commonwealth Co., 1882. “Donahoe’s Magazine - Google Books.” Accessed March 18, 2015. http://books.google.com/books?id=TinZAAAAMAAJ&pg=PA558&dq=easter+egg+Christians+Mesopotamia&hl=en&sa=X&ei=LS2CT6yFM_Sy0AGNm73kBw&ved=0CGkQ6AEwBzgK#v=onepage&q=easter%20egg%20Christians%20Mesopotamia&f=false. “The History of Al-Tabari - WikiIslam.” Accessed February 11, 2015. http://wikiislam.net/wiki/The_History_of_al-Tabari. Hislop, Alexander. The Two Babylons; Or, The Papal Worship Proved to Be the Worship of Nimrod and His Wife: Or the ... [s.n. ], 1862. http://archive.org/details/twobabylonsorpa00hislgoog.